"Content isn't used effectively in the sales process"
That might have been an appropriate title for the recent HBR article written by Frank Cespedes and Russ Heddleston. Instead it was entitled "4 Ways to Improve Your Content Marketing." It wasn't just the title which was inadequate, however. The entire article was based on a commercially convenient, yet inaccurate premise that B2B content marketing is the process of sending content to prospects during the sales process. The article draws on data accumulated DocSend's observations of content interactions. Heddleston's role as DocSend CEO isn't revealed until after the article. While no relationship is disclosed between the two authors, the article reads as though the "insights" grew from some consulting work which Cespedes might have done for the firm. Further, although there is no disclosure of any advertising/sponsorship relationship between HBR and DocSend, it reads almost like what's euphemistically called "sponsored content." Content Marketing is more than "Closing Deals"
The tagline on DocSend's website (it's value proposition if you will) is "Deliver the content that closes deals." In other words DocSend sells itself as a vehicle for delivering content during the sales process. By definition this means after a prospect has been identified, converted to a lead, and begun some sort of interaction with a sales person. Let's contrast that with the definition of Content Marketing provided by the eponymous Content Marketing Institute. A huge responsibility of content in B2B content marketing is to ATTRACT. In other words by answering questions which someone sits down to ask Google (or other search vehicles) one hopes to be served up as a search result, engender interest, get clicked, and then engage a new visitor on a website which they might not have found or visited otherwise. One they're there, content is intended to drive further engagement during which they find more value that facilitates their research. Eventually they may become a lead, and in the future (that can happen in a single website session, or may take years) they may begin to interact with someone in a sales function. We'll dig a little deeper into those factors next, but fundamentally this article fails to deliver on its title because it only explores a slice of what content marketing is about - using content to close deals. 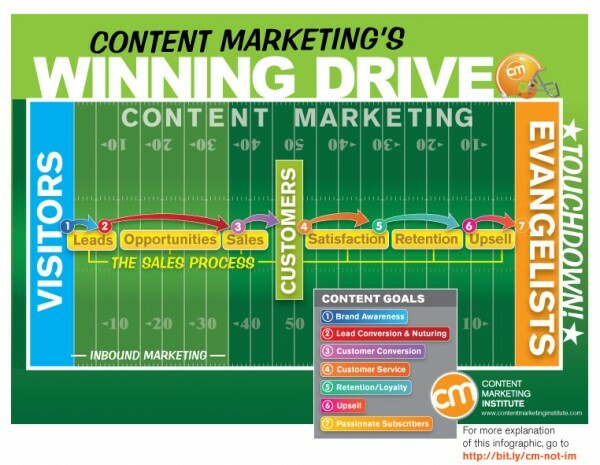 However the article's introduction uses a broader overview to set a context for content marketing ("attract prospects with content relevant to each stage of their buying journey and extend offers that motivate them to contact your sales team for a demo or discussion") and sites statistics around blogging (which isn't typically "delivered" to prospects - it's found.) These give the impression that it's exploring content marketing as CMI describes it. It even speaks to observations of interactions "at the top of the funnel" and highlights the difference between content for establishing awareness and interest vs. for sales. Then the authors note that their conclusions are drawn from observations of content which is uploaded and shared by sales people with prospects. We can reasonably assume therefore, that any observations of interaction that aren't part of the deal closing that DocSend supports, are based on sales people preemptively using the platform to push content to folks who weren't looking for it. That's cold calling with content. There's a place for this practice in a sophisticated business development program - but to issue guidelines for content marketing based on observing those results isn't sound. The bottom line regarding the applicability of these insights to "content marketing" as a discipline is that it's misrepresented. Mediocre salespeople can turn great content into a waste of bits & bytes. Like a sales person moving directly in their first call or meeting to some ham fisted "close" technique, spraying content around is the stuff of comedy routines. Superb content sent at the wrong time or with the wrong context will not get much engagement, regardless of the day of the week, length of content or type of device optimization (three areas in which the HBR authors draw conclusions.) Yet sending the perfect content at the right time, to the right people, at the right stage in their buying journey with the right context is incredibly effective. The ability to do that is what distinguishes an exceptional B2B complex sales professional. Of course it's possible that not knowing what content is available or being unable to find it may inhibit a few otherwise fabulous sales teams. But more often salespeople just blast out inane crap which marketing excels in creating....more info about features and benefits that don't speak to buyers's goals and challenges. So of course it performs poorly. It's implausible to draw conclusions about the practice of even a small portion of the content marketing world without any accounting for the quality of the content. We could assume that across 34 million interactions we'd find a distribution of quality. However, relative quality (a range of which the distribution would reflect) is different than absolute quality. While it's tempting to assume that such a large sample size solves for both, that's not research...that's assumption. It's likely that <3 minutes is all the time it takes for prospects to determine that content is vapid - not that content should take less than three minutes to consume because that's the maximum attention span of buyers who are "bombarded" with messages. Indeed there are compelling studies which show that the effectiveness of long-form content has increased as content has exploded in aggregate. There is one kind of content actually that has to dive deeper into the buyer's situation, the challenges they face and outcomes. That's a case study. And case studies are also particularly well suited for the "sales" discussion vs. the "attract" mission of content marketing. It's not surprising, therefore, that DocSend's data reflects outperformance of case studies. It's often among the most appropriate content for reps to send as they work to close deals. Because it focuses on what's important to them, it's one form of content which is generally more appealing to buyers than much of what marketing teams tend to create. Is most content optimized for mobile experience? How many .pdfs have you viewed that really are accessible by a smartphone? The article suggests that since most content is consumed on desktops, that optimizing for other devices is unnecessary. That could be absolutely correct. But there's no way of knowing whether is cause or effect. Is most viewed on desktops because it's inappropriate for mobile? Was this an opinion piece or a research piece? HBR prefers the latter. And the article referenced data. But in the end it delivered unsubstantiated opinion masquerading as research. That's perfectly OK....if that's clear. When it's not clear, it illustrates the problem with content marketing. Had it appeared on the DocSend site with a title "What we've observed about interactions with content sent on our platform, and what we guess that means to your sales enablement" it would have been fine. But that's neither what it promised nor what it did. Compounding the problem is that rather than simply publishing on DocSend, the authors coopted the gravitas of the Harvard Business Review as part of their content distribution approach. Good if you can get it, but not really straightforward. Maybe the article was originally more nuanced in it's presentation of data. Perhaps it was edited for length. Regardless of whether it started or just finished in this form, however, doesn't matter. HBR can do better than this. It normally does. Editors deserve mulligans too. Most importantly though, don't let this article, with its various shortcomings, inappropriately shape the content strategy and tactics for your business!